It seems that the obvious enthusiasm of the people to view the Apple tablet may still be drawn out. With rumors thick in the air of an early 2010 launch, this festive Christmas season has to lose out on the opportunity to see the much-awaited device. Speculations were swinging back and forth about the existence of such a tablet but it has now been confirmed that Apple will indeed be launching it early next year. 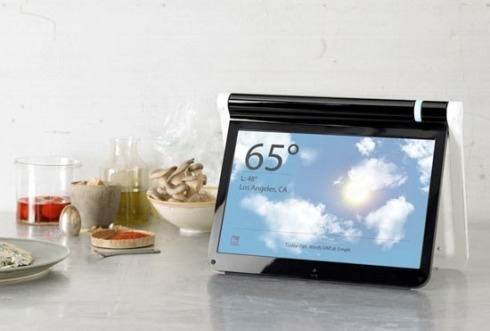 The tablet is expected to measure 10 inches diagonally with a touch sensitive interface. 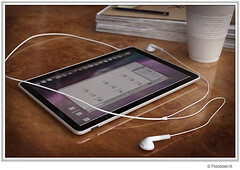 It is going to be a large iPod or iPhone touch providing wireless connectivity. Accessing media can be done through iTunes. Nokia has filed a patent application entitled "User Interface", that are known as a 3D multi touch patent. When I read Internet articles on this patent, I thought that it's a kind of device sensing 3D spatial position of a user's finger. However, the patent reveals a different configuration. It's not a 3D spatial input device like its another patent US2008005703. The patent describes a combination of force and touch sensing. Windows Touch vs PyMT: Why multi-touch programming on Windows is too complicated! Link: Windows Touch vs PyMT: Why multi-touch programming on Windows is too complicated! [Magic Mouse Teardown (1)] Struggling With Double-sided Tape -- Tech-On! Link: [Magic Mouse Teardown (1)] Struggling With Double-sided Tape -- Tech-On! Is Apple Magic Mouse Harder to Move Than Mighty Mouse? Multitouch blog featuring Media App, touchWorldWind, etc. Have you ever seen a bed mattress with an alarm clock? Well, this innovative approach has been successfully experimented by Florian Schärfer. The product features the coolest clock-bed combo design that you may never have seen before. 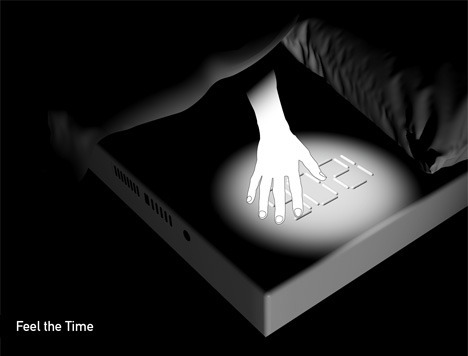 A Haptic, touch sensitive alarm with speakers and controls are ingeniously embedded within a bed. Incorporating a novel concept, the ‘MeltedAlarm clock’ is a masterpiece that offers you the comfort of a bed and service of a clock. So, now you can comfortably sleep and get up just on time to attend your important meetings/engagements. Brainchild of Florian Schärfer, the product is equipped with three control icons that let you to set your radio frequency along with alarm time. Get Ready For a Game of Soccer with Walky Robot! The ubiquitous recession does not seem to hurt the craze about robots in Japan. Some young students of the Graduate School of Media Design in Keio University have come up with another innovative robot. Walky Robot can be controlled with just a tweak to the iPhone interface. You used your fingers to access music and video on the iPhone till now. Now you can use them to control the movements of Walky. Anyone who has used the iPhone will confirm that it is the easiest thing to do. Gone are the fancy consoles, keyboards, joysticks and remote controls. Mere finger gestures are enough to set the robot into action. Litl webbook is the gadget that even the techno phobic members won’t mind using. It’s a multitasking portable device that allows the user to surf web, play video, display photos and also use it for several other regular functions that often laptop performs. Designed mainly to cater to the needs of home users, this mini 12-inch webbook has a user friendly and easy operating interface that can be easily used even by kids and elderly people. Just like a regular PC, it pulls content from the web via cloud-computing services. However, the system is engineered in such a manner that it pulls not only content, but also different applications from existing web-based services, like Google apps, Flickr and YouTube. 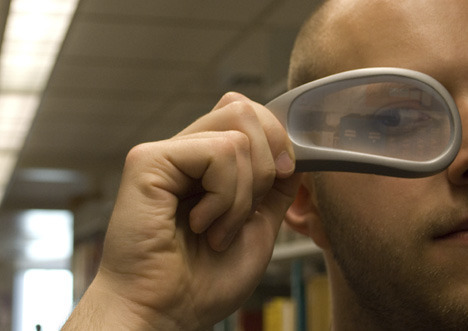 The respective content is displayed as “channels” which can be easily flipped by using the wheel attached into Litl Webbook’s hinge, or even by using the remote control. In contrast with laptops and netbooks, this easy-to-use device can be flipped over into easel mode and kept upright like a digital photo frame. When not using it as a laptop, you can simply prop this mini yet hi-tech gadget up as an easel and set it to display photos of your choice or stream some content from popular websites. Litl Webbook is equipped with plug-and-play connectivity by way of an HDMI output port that allows the users to connect their TV set to this portable device and enjoy their favorite shows with no interruption. Moreover, it features a wide degree viewing angle that allows a larger number of people to clearly view the screen at the same time. 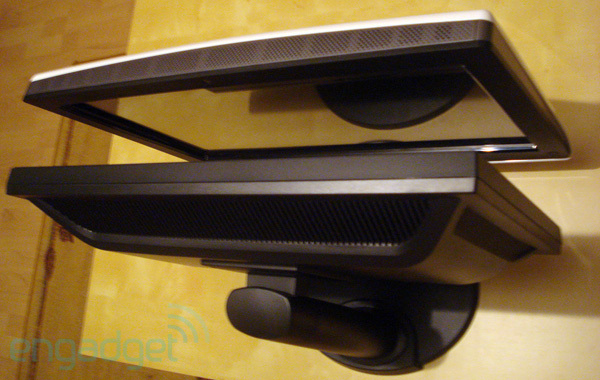 Unlike PCs, this device has been designed such that there are interactions with content and not with computer hardware. As part of this technique, the monitors and status indicators are not displayed onscreen at all time, but are monitored in the background and can be brought to a user’s attention only when required. Though not an ideal substitute of laptop, it definitely is an ideal product for home users because it’s less complex to operate and simple to maintain. It’s a young and half-organized but growing bibliographic list about touch screens, multi touch and touch user interface. References whose titles are prefixed by “*” are our favorites. It develops interactive systems for entertainment, advertising and design applications. SensoryMinds tweeted an interesting user interface posted at Multitouch+NUI – This Blows. The UI is called BAMB and proposed by Be a Mind Blower. Let’s first see BAMB in action. It is said that the BAMB interface uses Zyxio’s SensaWaft technology. The video below shows the performance of the adopted sensor system. Good. It seems that it can track directions of blowing with well implemented noise cancellation algorithms. But, at this time, I can only tell that the SensaWaft seems to use a MEMS air pressure sensor and recognition algorithms. The patents do not show much about its technologies. So, let’s explore other direction. Are similar products or concepts out there? Here are lists of what I found on the Internet. IMS-S410K adopts Emotion Framework developed by Fantalog Interactive. This video clip shows a demo of breath-controlled photo browsing. Nintendo also has showed off games that use game's blows. Since I’m not familiar with gaming, let the following articles say something for me. 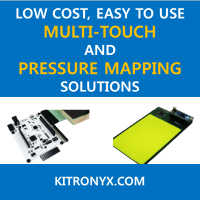 CyberLink provides various customizing touch solutions. Its clients include HP and ASUS. The video clip illustrates its operations very well. Smart Measure Cup – Displays Volume Accurately! Say goodbye to the various sizes of measuring cups that crowd your kitchen and create a messy situation when you need to measure different items. The Smart Measure Cup is a hassle-free solution for most of your measuring worries in the kitchen. Designers Ryan Eder & Chris Daniels designed the Smart Measure cup for Priority Designs, which is known for its innovative designs that truly blend necessity and invention together. Taylor Kitchenware has manufactured this smart product developing on the initial prototype, published in Yanko Designs. The Smart Measure Cup, as the name suggests, helps in measuring food items with ease. It has a small backlit LCD screen that displays unit type as well as the volume accurately. It also has unit conversions for you to choose the type of unit you want to select depending on your recipe. The Smart Measure Cup also allows the user to pre-set the volume prior to measuring. It has a small beeper that beeps as you exceed the volume pre-set by you earlier and makes you doubly sure that you take the exact amount effortlessly. The LCD screen can be detached from the cup before you wash the cup. This ensures that the LCD screen does not get wet and makes the use of the cup even more practical and simple. As the manufacturer of modern kitchenware, Taylor aim to make your effort in the kitchen less tiring and more of a fun time with newer appliances and the Smart Measure Cup is yet another addition to it. Though the original Smart Measure Cup design appeared to be much more trendy and stylish, the manufactured version -Taylor Digital Measuring Cup and Scale - tries to make it affordable to even a stiff pocket. And no matter which unit your recipe book suggests, you have a simple answer and you need not use a calculator to help you convert the volume before measuring. TRKBRD Working! from Rob Nero on Vimeo. With a little tweak MS Surface team has made a dummy doll a live monster. Awesome! The dummy has nothing but a mirroring mechanism that transfers an image beneath the bottom to an eye on its face. So, its eye moves fast following the cup. Yes, its eyeball is actually displayed on Surface. The monster doesn’t have any mechanics inside. Galaxy Dress – Visual Communication Wrapped In! Being the star of a party is not going to be that hard with these glowing dresses. The Galaxy Dress, yet another fantastic project from CuteCircuit, literally lights up any occasion. London-based designers Francesca Rosella and Ryan Genz use very small full-color LEDs to do speaking for their work. The dazzling Galaxy Dress also claims to be the world’s largest wearable display. Currently, showcased at the Museum of Science and Industry, Chicago, the Galaxy Dress is yet to hit the party floors. The designers intricately embroidered 24,000 LEDS into the smooth surface of silk and made sure they are flexible and stretchable to wear. The extra-thin flat LEDs are only 2x2 mm wide, which accounts for their clean finish look. These LEDs are also pretty light and the fluidity of the fabric makes it very comfortable to wear without giving you the feeling of being a walking Christmas tree. Talking about this wearable display, the Galaxy dress has about four layers of fabric like silk, organza crinoline and chiffon which are normally used for making designer gowns. The dress also has 4000 clear to light pink Swarovski crystals applied to the top layer. This also makes sure, that even after the batteries exhaust and the stilettos goes dark the dress sparkles with the crystals giving it a more ethereal appeal. Like any other typical evening gown, the organza crinoline underskirt used for the flounce makes the dress heavy. It has nothing to do with the light-weight LEDs. 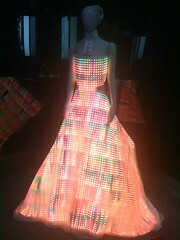 A few iPod batteries are placed inside the dress in a very well-hidden and comfortable manner which can make this dress glow for approximately 30 minutes to one hour. You need not worry about your feminine figure, as the dress has the proper cuts and curves like a normal evening gown. The Galaxy Dress is still in the prototypical stage. Visual communication can be taken into all new heights with this innovative literally illuminated dress. SKILSENS is an artificial sensing skin that has some characteristics similar to those of the human skin with the ability to sense the contact pressure, the localization of the pressure field, the shape and orientation of the object in contact. Pranav Mistry gave a talk at TEDIndia about his recent works and projects. He has developed many gestural input devices at MIT Media Lab. He continuously talked about bridging gap between real life and digital worlds. More specifically, it seems that he is interested in controlling and getting information using everyday objects. Here are some excerpts form his talk. What ever he named it, I call it a low-cost data glove. It’s made of two deconstructed mice. P. Mistry, "QUICKIES: the future of sticky notes," in Proceedings of the 27th international conference extended abstracts on Human factors in computing systems Boston, MA, USA: ACM, 2009. He also introduced a 3D input pen. SixthSense is a 3D gestural interface using a small project, webcam, and microphone. 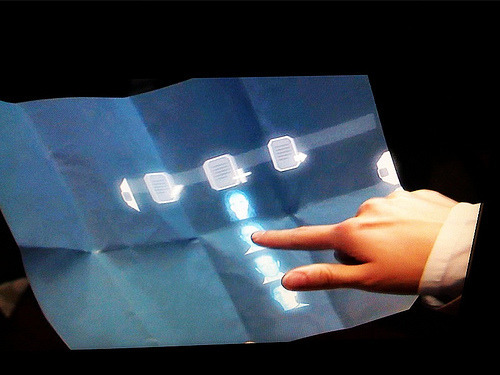 It turns everyday surfaces into multi-touch gestural input pads – the core function of SixthSense. It is achieved by combining image processing and gesture recognition with images gathered by the webcam. You can see four color markers on his fingers. Those explicit markers can help processing algorithms easily figures out a user’s gestures. SixthtSense can track touch with a microphone and camera. The microphone detects the sound of touch, and then the camera tracks the touch point. So, a normal sheet of paper acts as a computer with SixthSense. This demo shows exchanging information between two objects. Note that the concept of pick & drop was first presented by Sony.